A good healer touches a person’s body, mind and spirit. A great healer touches many people’s lives. In attempting to describe a healer who touches the lives of thousands of sufferers around the world may lead us to call that individual a saint. Saint Damien is appropriately recognized for his commitment in easing the suffering and caring for the thousands of suffering souls, banished to Kalaupapa because they had Hansen’s disease. An almost forgotten healer was a young (24-years old) Black chemist and pharmacist, who made a revolutionary discovery that changed the lives of Hansen’s disease sufferers. Born on July 24, 1892 in Seattle, Washington, Alice Augusta Ball was the daughter of James P Ball and his wife, Laura; she lived in a middle or even upper-middle class household. Ball’s grandfather, JP Ball, Sr, a photographer, was one of the first Blacks in the US to learn the art of daguerreotype and created in Cincinnati one of the more famous daguerreotype galleries. During his lifetime, Ball also opened photography galleries in Minneapolis, Helena, Montana, Seattle and Honolulu, where he died at the age of 79. After moving to Hawaiʻi in 1903 and attending elementary school here, Alice Ball and her family moved back to the continent where she attended high school in Seattle, earning excellent grades, especially in the sciences. After a stint with the family living in Montana and then returning to Seattle, Alice Ball entered the University of Washington and graduated with two degrees in pharmaceutical chemistry in 1912 and pharmacy in 1914. In the fall of 1914, she entered the College of Hawaiʻi (later called the University of Hawaiʻi) as a graduate student in chemistry. On June 1, 1915, she was the first African American and the first woman to graduate with a Master of Science degree in chemistry from the University of Hawaiʻi. In the 1915-1916 academic year, she also became the first woman to teach chemistry at the institution. But the significant contribution Ball made to medicine was a successful injectable treatment for those suffering from Hansen’s disease. She isolated the ethyl ester of chaulmoogra oil (from the tree native to India) which, when injected, proved extremely effective in relieving some of the symptoms of Hansen’s disease. A College of Hawaiʻi chemistry laboratory began producing large quantities of the new injectable chaulmoogra. During the four years between 1919 and 1923, no patients were sent to Kalaupapa – and, for the first time, some Kalaupapa patients were released. The “Ball Method” continued to be the most effective method of treatment until the 1940s and as late as 1999 one medical journal indicated the “Ball Method” was still being used to treat Hansen disease patients in remote areas. At the time of her research Ball became ill. She worked under extreme pressure to produce injectable chaulmoogra oil and, according to some observers, became exhausted in the process. Unfortunately, Ball never lived to witness the results of her discovery. She returned to Seattle and died at the age of 24 on December 31, 1916. The cause of her death was unknown. 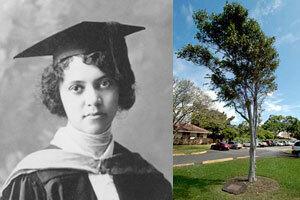 On February 29, 2000, the Governor of Hawaiʻi issued a proclamation, declaring it “Alice Ball Day.” On the same day the University of Hawaiʻi recognized its first woman graduate and pioneering chemist with a bronze plaque mounted at the base of the lone chaulmoogra tree on campus near Bachman Hall. In January 2007, Alice Augusta Ball was presented posthumously the University of Hawaiʻi Regents’ Medal of Distinction, an award to individuals of exceptional accomplishment and distinction who have made significant contributions to the University, state, region or nation or within their field of endeavor.